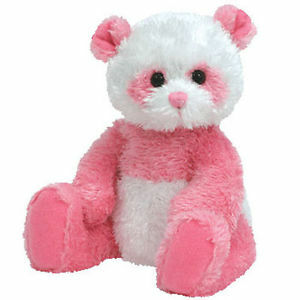 Dainty is made from a fuzzy white material with light pink legs, arms and ear. She also has a pale pink band around her body and around her eyes. She has black button eyes and a pink embroidered nose. Instead of black, my fur is pink! Dainty was released on 31st July 2007. Her birthday is on 5th July 2007. Dainty is a Panda bear. She retired on 27th December 2007.